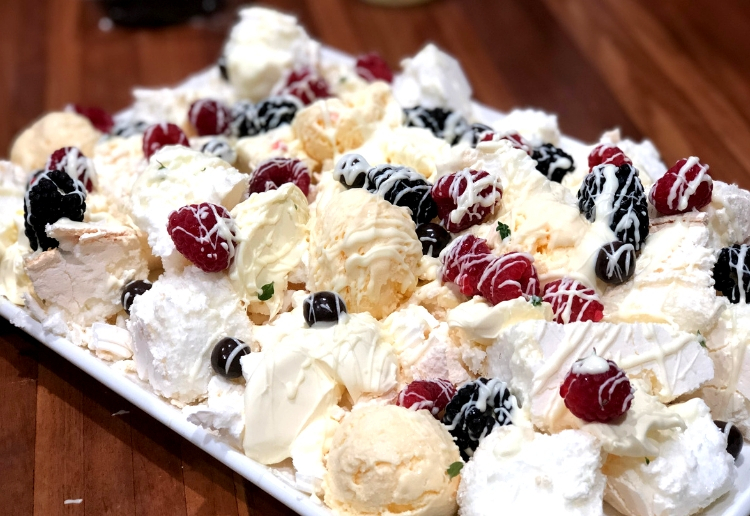 This White Choc Berry Eton Mess Recipe is an absolute cinch to make but looks incredibly impressive. Every time we serve it, we get oohs and aahs from around the table. Find a big, long platter and break up the pavlova and meringue nests and spread over the platter. Drop dollops of double cream and yoghurt all over the pavlova chunks and meringue nests. Nestle the scoops of ice cream in amongst the pav/meringues/cream/yoghurt. Spread the berries evenly over the top of everything. Drizzle the melted white chocolate over everything too! This looks amazing and super impressive. Yum – I hate baking so this looks perfect! It looks so complex but very easy to make! This just looks to die for!! Ok in all seriousness, looks Devine, I like that it’s got yoghurt and fruit to balance out the sugar. Great idea – my kids are always asking to bake but this would be so much easier and I’m sure they’d enjoy eating afterward! Not my type of recipe but thanks for sharing. You are right, it does look super impressive and delicious. Yet is super simple to create, no baking required. Dessert for tonight, thank you very much! Wow the kids did an amazing job. I absolutely love this dessert and the idea of getting the kids involved. This looks so beautiful and I love the simplicity, amazing! It looks so tempting I’m glad it’s just a photo. At the moment I have low iron levels. Some dairy products (the ones that taste the best) contain phophorous which depletes iron from your blood. Ive never tried ice cream with pavlova before!